1. Preheat the oven to 180°C/fan 160°C/350°F/gas mark 4. Butter two 20cm round sandwich tins and line with baking parchment. Keeping them separate, place the nuts both for the cake and the caramelised nuts on baking trays and roast for six minutes. Cool. 2. Lay the walnut halves for the caramelised walnuts on a baking tray lined with baking parchment. Have a sink or washing-up bowl of cold water to hand. Put the sugar and 100ml of cold water in a saucepan and dissolve the sugar over a gentle heat, stirring with a metal spoon. Increase the heat to a boil, stop stirring and occasionally brush the sides of the pan with a pastry brush dipped in cold water, to prevent crystals forming. Boil until the mixture turns a beautiful caramel gold and has thickened. Plunge the base of the pan into the cold water, then, using a teaspoon, drizzle the caramel over the walnuts on the tray and leave to set. 3. De-seed all 20 cardamom pods for the cake and buttercream, grind the seeds to a powder in a mortar and pestle and sift it to remove husks. Keep one-quarter aside for the buttercream. 4. In a food mixer (or in a bowl with a hand-held electric whisk), cream together the butter, sugar and coffee until very light and fluffy (a good five minutes). Gradually add the eggs, then the almonds and cardamom. Gently fold in the flour and chopped nuts; don’t over-mix. Divide between the tins and bake for 20–25 minutes, or until a skewer comes out clean. Cool on a wire rack. 5. To make the buttercream, in a food mixer (or in a bowl with a hand-held electric whisk), beat the butter and icing sugar for a good five minutes. Add the vanilla extract, cardamom, coffee and cream and beat until smooth. Spread over both cakes, then place one on top of the other. Spread it over the sides, too, if you like. 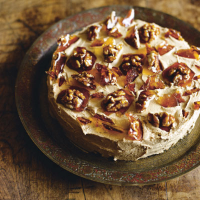 Decorate with caramelised walnuts and shards of the caramel, to make a dramatic decoration. This recipe was first published in Tue Jul 30 09:50:00 BST 2013.